It is that time again, as USA Firearm Training brings you another monthly Guardian Nation broadcast! This month we will be speaking with Alex Ragulsky. Alex is an awesome guy whose career as a US Air Force security policeman began in 1975. 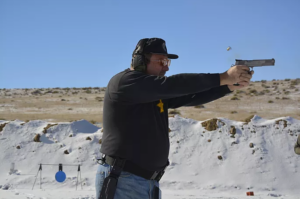 During which time he became certified as a firearms instructor and since that certification in 1979 Alex has worked as a deputy sheriff, patrol officer, detective, sergeant and instructor at 3 different Colorado law enforcement agencies. On top of his stellar career in the world of law enforcement, Alex is an expert competitive shooter who has shot air rifle, shotgun, pistol and three-gun competition. In 2012 Alex was inducted into the Colorado State Trapshooting Association's Hall of Fame. He has won many state titles not only in Colorado but also in many surrounding states. Alex has successfully competed at the Bianchi Cup and the Glock Sports Shooting Foundation, as well as several other shooting venues. In 2014, Alex achieved MASTER status with the Glock Sports Shooting Foundation. In addition to being an NRA instructor and training counselor, Alex is also an armorer for Glock, Beretta, Smith and Wesson and Remington firearms. Now, In addition to being a full time police sergeant, Alex is a frequent guest lecturer for a legal protection firm speaking about a wide range of legal and tactical topics which is what he will be doing tomorrow, November 17th on our Guardian Nation live broadcast at 9:00 EST, 8:00 CST, and 7:00 MST. We are very honored to have Alex joining us and can't wait to hear what he has to say. To gain access to the webinar, you are going to be a member of Guardian Nation, and once you are you will be able to join in and ask Alex any questions that you might have, LIVE. We hope to see you there! How Many Repetitions Does it Take?